I have ran behind on posting my What I've won post last month. D started nursery/ pre-school and at the start he was there for around an hour in the middle of the day before it slowly started increasing. In reality we spent around 2 and a half hours getting up, breakfast, dressed and out the door. Those 2 and half hours in the morning usually would have been spent tiding up, starting the daily cleaning and having breakfast while I did some quick competitions. With all of this being pushed back I found that I ended up with much more needing done by the time D got home again. I wasn't sitting down to do competitions until bed most nights and even then I was preparing his uniform for the next day etc. I knew September wasn't going to be a great month not long after it started. Although it actually didn't turn out to be a bad month either. I had 4 wins throughout September. The first win was already a week into September. 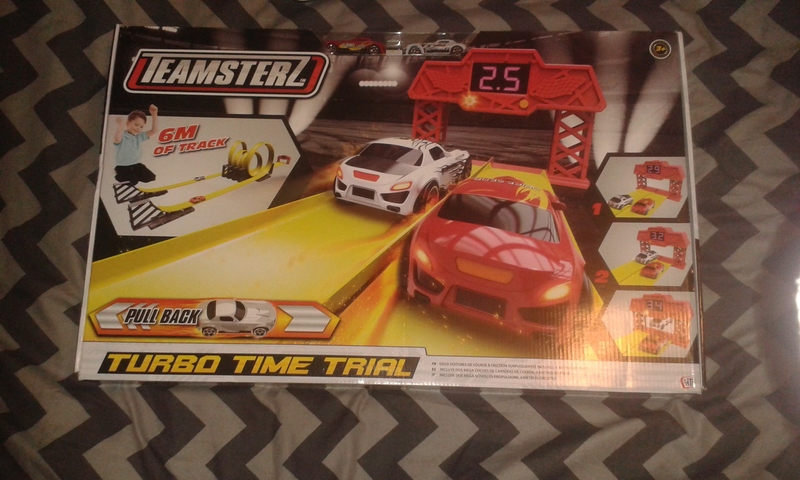 I won this Teamsterz Rapid Fire track set. This was a Facebook competition for the Teamsterz Facebook page starting up. It was very low entry with under 50 entrants and to enter I had to like the page and comment under the post. I was delighted when I got the notification to say I had won as I knew D would love this! He really enjoys playing with cars and tracks of any sort but he loves making cars go really fast. The aim of this whole set is to race your opponents car to the end and be the first to pass the finish line where you will get your finishing time. I have put this away for Christmas and I'm looking forward to seeing D's face! My second win of September was on Twitter. I won with @ValsperPaintUK and I won a voucher to buy some wood and metal paint in any colour from their range. To enter all I had to do was retweet and follow them on twitter. I did also reply saying that it would be perfect for painting my son's dressing up stand which is being made for Christmas by his uncle. Honestly this could not have came at a better time. I was getting ready to start looking at wood paints for just that! I haven't yet decided on a colour to get but I will be going to get this soon to allow the dressing up stand with plenty of time to properly dry before we try to transport it. My third win in September was also on twitter. I won an Upbeat Drinks cool bag. They gave away to the first 500 people to follow and retweet the competition post. I entered right at the end with only a few retweets left to go. This will come in very handy for when we are out and about next year. My final win of September was actually around the start of the month. I a game called Mercenarys. The game is on steam and Simon is enjoying it. Simon had asked me to go watch a channel on Twitch and enter the giveaways the page owner was holding to win games. The page is quietrevolution. There where a lot of games being given away. I entered each by typing a command in the chat and twitch's automated system would pick a random winner. I was announced as the winner to one of the last 3 competition. All in all September turned out to be an okay month with a good few wins that will be used often or will come in very handy for us. In October I really found that I did find more time to enter competitions and I seemed to find that I was enjoying the time spent entering more than the last few months. Throughout October I was very determined to get a good few wins as I know the Advents are now well on their way and there are some currently open. I'm trying to get some practice in. My first win of October was a lovely little box of sweets through the post. I won this on Facebook by liking and commenting on the competition post. 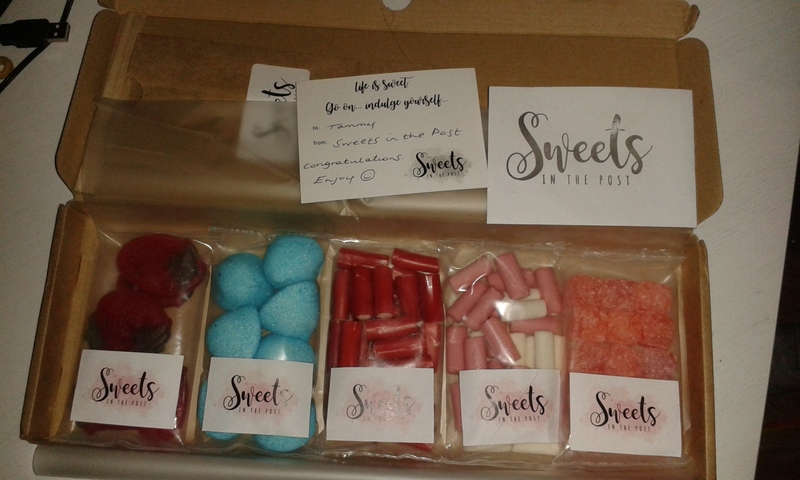 The page I won this lovely little box from is Sweets In The Post. I was really excited to get these as it's very rare that we get any special little treats like this and we got to pick which sweets we wanted to have in our box. The box also came with a little gift card and a bag to keep the opened bags of sweets in to keep them fresh which I loved! My second win of the month was a biggie! I won on Facebook again with The Parenting Feed. The competition was to like and comment "TK Maxx" on the post. It was for Halloween and I was so shocked when I got the notification to say that I had won. I didn't get the voucher until after Halloween but I didn't mind as I knew I was going to spend the money on gift for D's Christmas/ Birthday. 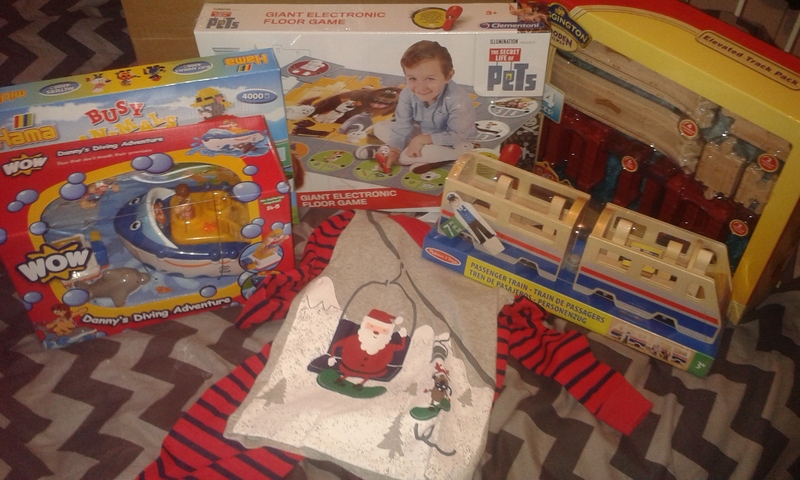 With the voucher I bought a lovely pair of Christmas pj's for his Christmas Eve box, an electronic The Secret Life of Pets puzzle, a Melissa & Doug passenger train, a Chuggington wooden track extension pack, a Wow Toys Danny's Diving Adventure to and A Huma Beads Busy Animals pack. I got these toys instead of something big or a set as we have lots of other toys from the ranges and I think D would enjoy a range rather than one or two sets of toys. 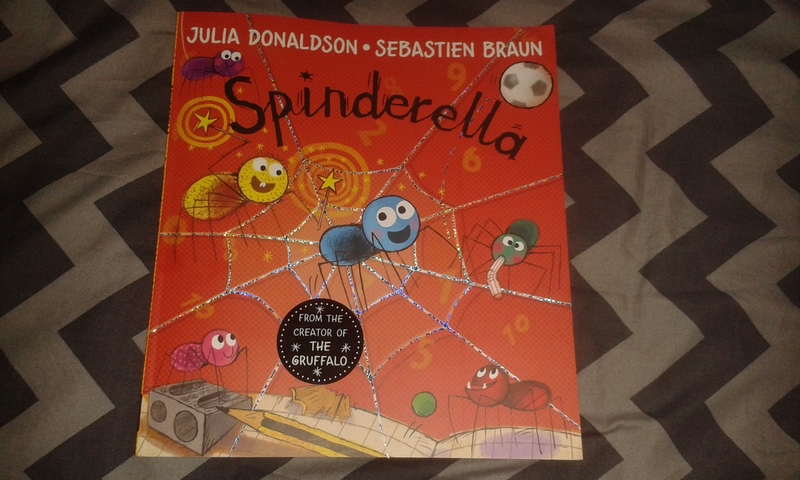 My third win of October was on the same day as the TK Maxx voucher and I was delighted when I got an email from Toppsta to say D had won the new Julia Donaldson book Spiderella. We are all huge fan of Julia Donaldson and we are growing quite a good collection of her books. D adores reading the Gruffalo along with her other books. 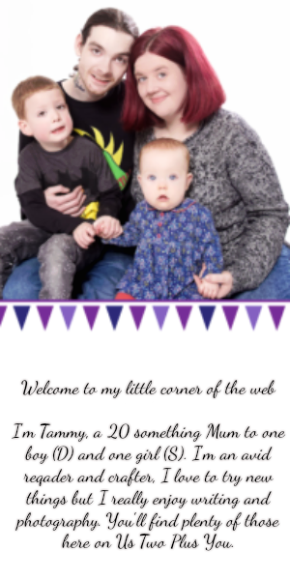 He knows every word to the Gruffalo by heart and I knew that he would really enjoy reading about Spiderella the spider who really wants to count and understands the importance of numbers in every day life. D loves the book and we have read it regularly. 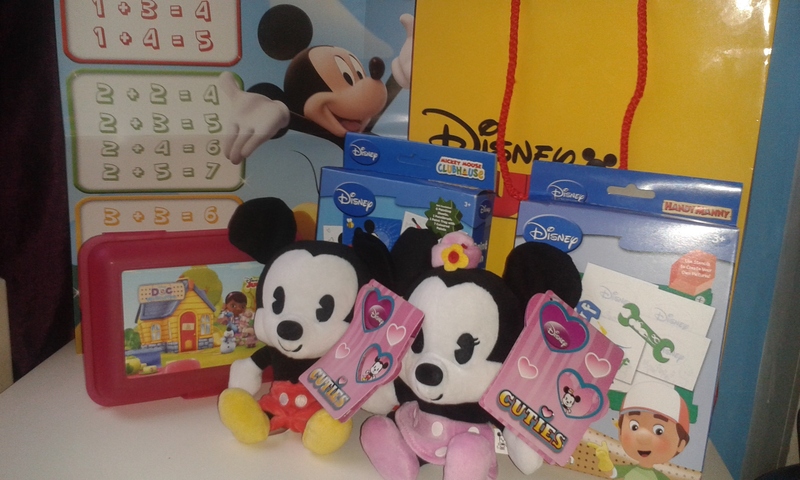 I also won on the Disney Junior Tea Party which is a Facebook Chat every Tuesday morning on their Facebook page. I have won with them before, a few months ago I won a mini Henry Hugglemonster plush which D loves. So when I got a message to say I had won a runner up prize i was both delighted and slightly confused as they hadn't mentioned any runner up prizes. I had to wait for the prize to show up and when it did I was rather shocked! I was expecting a little plush and maybe some sweets or a little booklet of activities. Inside was a Mickey Mouse poster to help with counting, a Mickey and a Minnie Cuties plush, a Doc McStuffins sandwich box, a stencil kit Handy Manny themed and a Mickey mouse Club House colouring set. I am really pleased with this runner up prize. My final win of October was on Twitter. 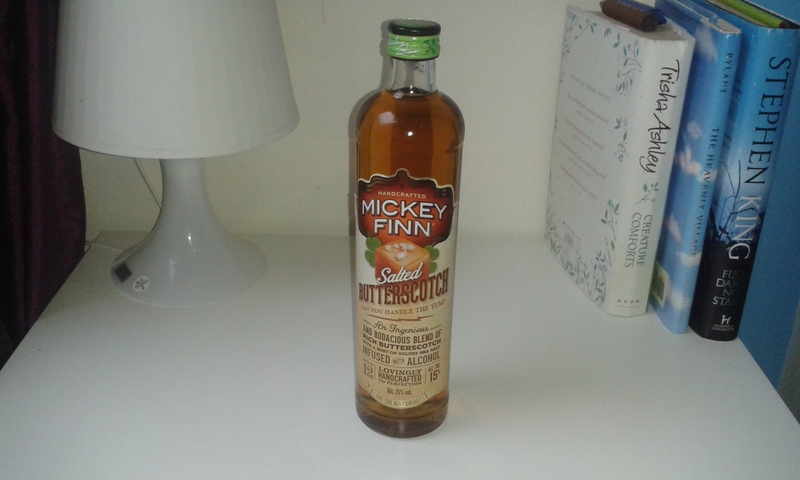 It was from Mickey Finn and I won a bottle of their salted caramel liquor to participate in their #BakeTheMickey competition however just after the bottle arrived I sent them a message to find out what I had to do to enter the big competition and after 2 attempts I have had no reply so I don't think I will actually be able to participate which is a shame but we will love the bottle anyway! October didn't turn out to be a bad month at all with a big win and 4 smaller wins too. Now that we are in November I am looking forward to preparing for the Advents along with getting lots of blog posts written in between the competitions I can manage to get done. I am determined to win more throughout the last two months of this year and will do my best to find a way of fitting everything into the day as I have a fair bit of crafting and sewing to do in preparation for Christmas along with putting up our decorations!